1. Summary: Warm Dark Matter (WDM) is hot topic in galaxies, cosmology and implies novelties in the astrophysical, cosmological particle and nuclear physics context.Warm Dark Matter Cosmology (ΛWDM) provides the same successfull large scale results and CMB results than Cold Dark Matter (ΛCDM) and succesfully agrees with the observations at the galactic and small scales. A Turning Point operated recently in the Dark Matter research: Warm Dark Matter (WDM) emerged impressively over Cold Dark Matter (CDM) as the leading Dark Matter candidate. WDM solves naturally the problems of CDM and CDM + baryons. ΛWDM provides the same large scale and CMB results than ΛCDM and agrees with the observations at the galactic and small scales. Warm Dark Matter (WDM) implies progresses in the astrophysical,cosmological, particle and nuclear physics context. This workshop addresses the last developpements in WDM, including its distribution function and equation of state, the quantum mechanical framework to galaxy structure reproducing in particular the observed galaxy cores and their sizes and the dwarf galaxies. This workshop puts together astrophysical, cosmological, particle and nuclear WDM, astronomical observations, theory and WDM analytical and numerical frameworks which reproduce the observations. The Workshop addresses as well the theorical and experimental search for the leading WDM particle candidate: keV sterile neutrinos. The recent impact of WDM astrophysics, its signatures and constraints with high redshift galaxies, clusters, cosmic recombinantion, 21 cm, with or for the JWST, HST, SKA, AstroH and gravitationnal lensing will be treated. 2. The New Dark Matter Situation Today and WDM state-of-the-art : Warm Dark Matter (WDM) research is progressing fast, the subject is new and WDM essentially works, naturally reproducing the astronomical observations over all scales: small (galactic) and large (cosmological) scales (ΛWDM). Astronomical evidence that Cold Dark Matter (ΛCDM) and its proposed tailored baryonic cures do not work at small scales is staggering. A. The fermionic quantum pressure of WDM ensures the observed small scale structures as the cores of galaxies and their right sizes (including the dwarf galaxies). N-body simulations in classical (non-quantum) physics do not take into account the fermionic quantum pressure of WDM and produce unreliable results at small scales: That is reason of the too small core size problem in classical (non-quantum) N body WDM simulations and its similar dwarf galaxies problem. B. Two observed quantities crucially constrain the DM nature in an inescapable way independently of the particle physics model: the average DM density rho and the phase space density Q. The observed values of rho and Q in galaxies today robustly point to a keV scale DM particle (WDM) and exclude CDM as well as axion Bose-Einstein condensate DM. C. Lyman alpha bounds on the WDM particle mass apply only to specific sterile neutrino models and many sterile neutrino models are available today for which the Lyman alpha bounds are unknown. Therefore, WDM cannot be disfavoured in general on the grounds of the Lyman alpha bounds only valid for specific models, as erroneously stated and propagated in the literature. Astrophysical constraints put the sterile neutrino mass m in the range 1< m <10 keV. For a thermal relic most of the constraints and last results points to m about 2 keV or nearly larger. For a dark matter aprticle decoupling at thermal equilibrium (thermal relic), all evidences point out a 2 KeV particle. Remarkably enough, sterile neutrinos decouple out of thermal equilibrium with a primordial power spectrum similar to a 2 keV thermal relic when the sterile neutrino mass is about 7 keV, and therefore, WDM can be formed by 7 keV sterile neutrinos. MARE, KATRIN, ECHO and PTOLEMY experiments could detect such a keV sterile neutrino. It will be a fantastic discovery to detect dark matter in a beta decay or in electron capture. A exciting WDM work to perform is ahead of us. On the CDM particle physics side, the situation is no less critical: So far, all the dedicated experimental searches after most of twenty five years to find the theoretically proposed CDM particle candidate (WIMP) have repeatedly failed. The CDM indirect searches (invoking CDM annihilation) to explain cosmic ray positron excesses, are in crisis as well, as wimp annihilation models are plagued with growing tailoring or fine tuning, and in any case, such cosmic rays excesses are well explained and reproduced by natural astrophysical process and sources. The so-called and continously invoked 'wimp miracle' is nothing but being able to solve one equation with three unknowns (mass, decoupling temperature, and annihilation cross section) within wimp models theoretically motivated by SUSY model building twenty five years ago (at that time those models were fashionable and believed for many proposals which is not anymore the case). After more than twenty five years, and as often in big-sized science, CDM research (CDM+ baryon simulations, direct and indirect WIMP experimental research and model building), has by now its own internal inertia and own organized community, without reproducing the astronomical observations and failing to provide any experimental signal of wimps (except signals compatible with experimental noise). Growing CDM + baryon galaxy simulations involve ever increasing large super-computers and large number of people working with; CDM particle wimp search involved (and involve) large and long-time planned experiments, huge number of people and huge budgets. 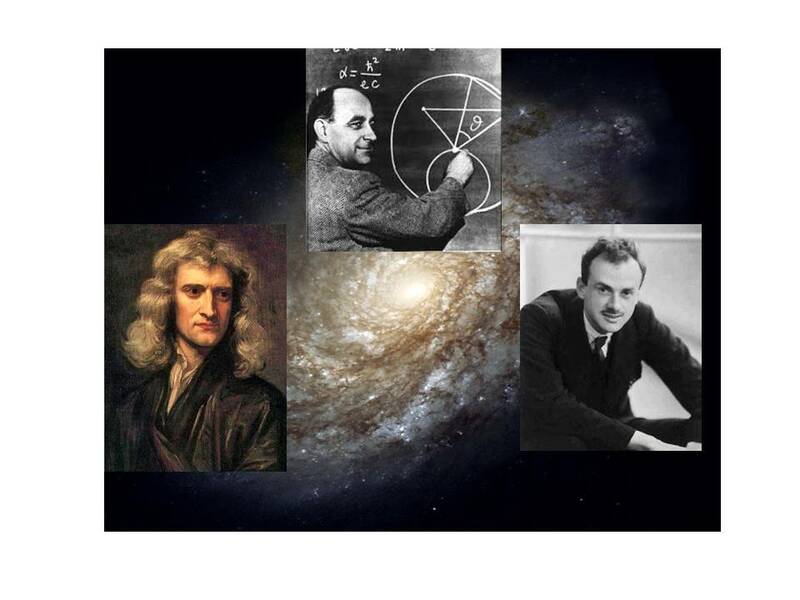 One should not to be surprised then if a strategic scientific change have not yet operated in the CDM + baryon research and in the wimp research, given the way in which the organization operates, although their real scientific situation is of decline. Wimps are not the DM particle, DM is not Cold because the right DM particle is at the keV scale, DM is Warm. (I) Conceptual context: Dark Matter in cosmology and astrophysics: perspective and prospective of the research in the subject: Theory and observations. The emergence of Warm (keV scale) Dark Matter from theory and observations. (III) Computational framework with the equations of physics. Analytical and numerical frameworks. The new important physical ingredient in galaxy structure: quantum mechanics. Classical (non quantum) numerical simulations with Warm Dark Matter and resulting structures. Results versus observations. Special attention will be payed to the astrophysical understanding of the dark matter problems and its solution, the use of analytic and numerical methods which determine the properties, the density profiles, masses, sizes and evolution, the distribution and the nature of Warm Dark Matter. Astrophysical and cosmological observational signatures of Warm Dark Matter, steriles neutrinos and their experimental search. Kinetic theory and the recent progress in solving the Boltzmann-Vlasov equation to obtain the observed universal properties of galaxies. Warm (keV scale) dark matter N-body simulations in agreement with observations at large and intermediate scales. The phase-space density of dark matter. The impact of the mass of the dark matter particle on the small scale structure formation and the choice of the initial conditions. The keV scale Dark Matter (Warm Dark Matter): Observational and theoretical progresses. Large and small scale structure formation in agreement with observations at small galactic and at large scales. Active and sterile neutrinos mass bounds from cosmological data and from astrophysical and X ray data and from high precision beta decay experiments. News on neutrinos and eV scale sterile neutrinos. News from reactor and accelerator experiments on neutrinos and their science implications. The Thomas Fermi framework to describe the structure and physical states of galaxies in agreement with observations. The DM distribution function and the equation of state of galaxies. Universal and non universal profiles. Cored density profiles with WDM core sizes in agreement with observations. Supermassive Black Holes : Theory and Observations. The clarifying and unifying WDM framework for stars, galaxies and cosmology. All Lectures are followed by a discussion. All participants are invited to take part in the discussions. Enough time will be available for the discussions. The Meeting is open to all scientists interested in the subject. Registration is mandatory. Registration information is given below. The format of the Meeting is intended to allow easy and fruitful mutual contact and communication. 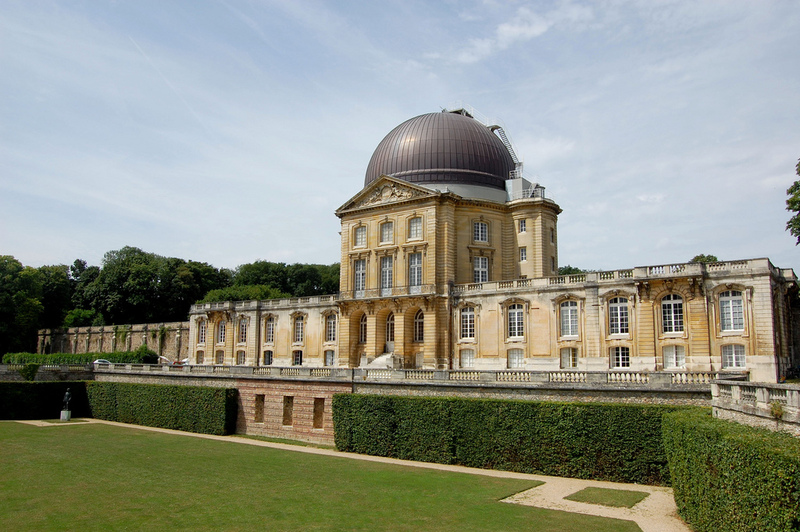 Sessions last for three full days in the beautiful and green Meudon campus of Observatoire de Paris in the historic Castle with the Great Dome building ("Château Grande Coupole") where CIAS (Centre International d´ Ateliers Scientifiques) is located. All lectures and presentations will take place at the Castle Conference Room (Salle de Conferences du Château) in the historic Castle building. All Coffee-Tea breaks will take place at the Urania Hall aside the castle conference room in the same building. The Registration desk and the Secretariat of the Workshop take place at the Urania Hall. Discussions and working sessions all during the workshop will take place at the CIAS rooms aside the Urania Hall. Informations on the previous Meudon Chalonge Workshops and of the school programmes are available at https://chalonge-devega.fr (lecturers, lists of participants, lecture pdf files, Highlights and Conclusions, and photos during the Colloquia Workshops). The Status of the ECHO experiment for the investigation of keV sterile neutrinos. Local and practical information can be found below. The Meeting is open to all scientists interested in the subject but Registration is mandatory. Certificates of participation will be delivered by the Secretariat during the Workshop upon request. An automatic mail is sent to you after your on line registration. The LIST of Registered confirmed Participants will be posted in May. BADGES for all registered confirmed participants in the list will be available at the Registration desk from Wednesday 15 June at 8:10 am. Please wear your badge all during the Workshop, which will make easy your access and circulation within the Paris Observatory Meudon campus. We look forward to seeing you in Meudon for a creative, fruitful and enjoying meeting. Participants should make their reservations by their own. A list of hotels in Paris nearby Montparnasse station is provided below. Welcome of the participants and Registration starts on wednesday 15 June at 8:00 am at the Urania Hall in the historic Meudon Castle ("Château de Meudon"). Tickets for lunch will be on sale at the registration desk from Tuesday morning. Lectures start on Wednesday 15 JUNE at 8:00 am in the Castle ("Chateau") CIAS building . We shall strictly stick to the timetable during the whole meeting. All lectures and events will start at the indicated times sharp. All COFFEE-TEA-MATE-CHAMPAGNE BREAKS take place in the Urania Hall in the CIAS Château building. LUNCH is served at the Self-service Restaurant of Observatoire de Paris at Meudon (located very near from the "Château" building, inside the Meudon campus, around the pond). The PHOTO of the group will be taken in the middle of one of the main entries of the "Chateau". The COCKTAIL/RECEPTION for all participants and accompanying persons will be offered on FRIDAY 17 JUNE in the late afternoon at the terrasse (if weather allows it) aside Urania Hall; otherwise, inside the Castle. Please Notice: The Workshop ends after the COCKTAIL/RECEPTION in the late afternoon of Friday 17 June. All participants and lecturers are expected to stay untill the end of the Meeting. LOCATION : The entrance of the Observatoire de Paris at Meudon is 5, Place Jules Janssen, F-92 190 Meudon (see below how to reach Meudon). Lunch is served at the Self-service Restaurant of Observatoire at Meudon (located very near from CIAS Castle, inside the Meudon campus, around the pond). The tickets for lunch will be available at the Conference registration desk from Thursday morning. On Friday, there will be a Cocktail/Reception in the the late afternoon in the Urania Hall/terrasse. The Observatoire Self-Service Restaurant is closed for dinner and on Saturdays /Sundays. Some Restaurants are listed below. 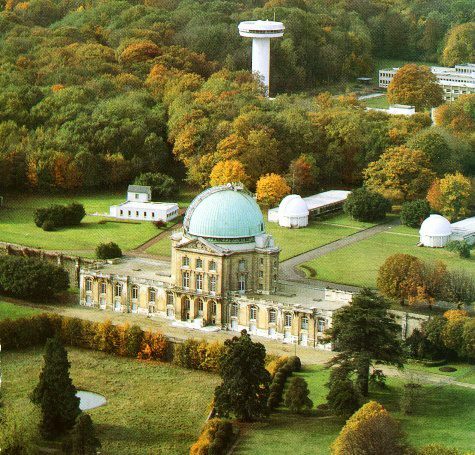 Meudon Observatory is located Place Jules Janssen , in Meudon at the top of the Avenue du Château. By train (French railways - SNCF): At Paris-Montparnasse station, take the train going to Sèvres or to Versailles-Chantiers, Rambouillet, Chartres, (which frequency is every 15 min.). Make sure that the train stops at the Meudon or Bellevue stations. Get out at the 4th station: Bellevue (after Vanves-Malakoff, Clamart and Meudon stations). Once outside Bellevue station, turn left (passing the church aside the station) and take the green Avenue du Château bordered by trees: the entrance of the Observatory is on the top of the hill. About a 10/15 minutes walk to reach the gates of the Observatory. [There is also a mini bus (circular local line) from the Bellevue station to the Observatory]. If you stop at the Meudon station: outside the station, turn to the right, after 200 m turn again to the right to take avenue Corbeiller [where the Meudon Municipality is located (Mairie de Meudon), ahead up to the top of the hill along avenue Corbeiller, rue Jacqueminot lined with stately chestnut trees. Once arrived, use the map of the Observatory campus: Chateau Grande Coupole CIAS where the meeting takes place, (building 9 in the map) is on the terrasse (take the staircase in the garden at the left after the entry and then at the left straight on the road along the terrasse bordered by the chestnut trees. By car there are 2 possible routes : Take the périphérique, exit at Quai d Issy, then go towards Issy les Moulineaux, Sèvres and finally Meudon Take N 118, from the Pont de Sèvres, going towards Chartres Orléans, exiting at Meudon Sèvres and then going towards Meudon. Mercure Raspail Montparnasse, 207 bd Raspail, Paris 75014 .Tel.33 (0). 14320-6294, fax 33(0).14327-3969. Hotel du Midi, 4, Av. René Coty, Paris 75014. Metro : Denfert-Rochereau. tel. 33(0).14327-2325. fax 33(0).14321-2458. La Closerie des Lilas, 171, boulevard Montparnasse. Tel. 014051-3450.Open everyday till 1 am. Formerly a Café littéraire had as customers Baudelaire, Verlaine, Gide, Jarry, Apollinaire, Modigliani, Hemingway, Lenin and probably Trotsky. Keeps a litterary crowd of customers like Philippe Sollers. The present chef Jean-Pierre Cassagne has renovated the house and the excellent meals. Besides the restaurant there is `brasserie' where meals are alsoserved. Menu 43 euros (including wine), à la carte 90 euros. La Rotonde Montparnasse, 105 bd. Montparnasse, Tel. 0143266884. Open every day from 12 am till 1pm. www.rotondemontparnasse.com Typical parisian restaurant since 1911. Seafood, oysters, famous Salers entrecote, good fish, selected Auvergne cheese and good desserts. Landmark of the Montparnasse district had as regular customers artists, musicians, writers and politicians: Modigliani, Picasso, Soutine, Cocteau, Diaghilev, Debussy, Nijinski, Stravinsky, Man Ray (and Kiki), Breton, Aragon, Prevert, Queneau, Hemingway, Gershwin, Henry Miller, Scott Fitzgerald. Meetings of Trotsky with fellow bolcheviks in the first floor room to organize the 1917 russian revolution were often interrupted by the french police. Menus 35 and 43 euros. La Coupole, 102 bd. Montparnasse, Tel. 0143201420. Open every day from 12 am till 1 pm. Typical Art Deco parisian restaurant open in 1927. Seafood, salmon rilletes, abundant sauerkraut, fresh codfish a la plancha, entrecote with french frites, lamb curry india style, excellent desserts. Among regular customers in the past: Cocteau, Prevert, Sartre, Beauvoir, Picasso (who met here Dora Maar), Matisse, Piaf, Montand. 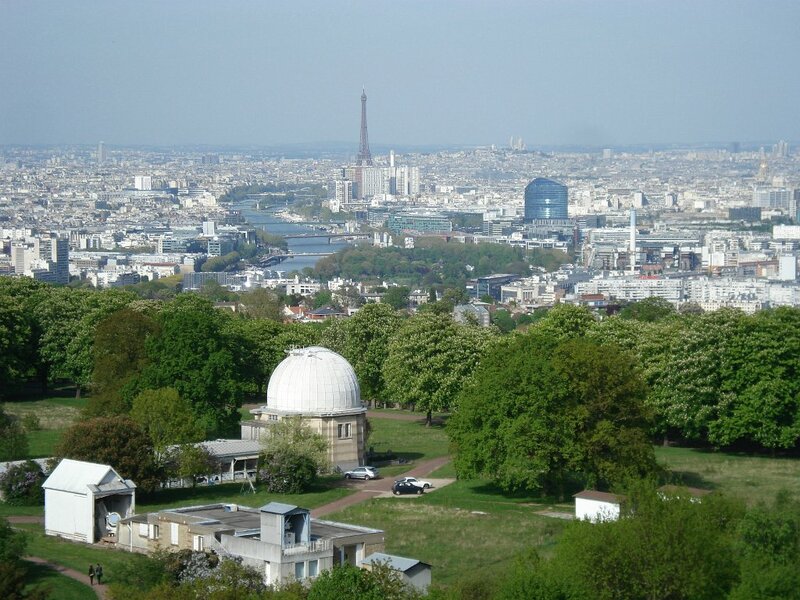 At present the Observatoire de Paris owns three campuses: Paris, Meudon and the radioastronomy station at Nançay. More than 700 scientists, technicians and administrative staff work there. The history of the present Meudon Castle (Château de Meudon) starts several centuries ago. The new Château de Meudon over where the cupola of the Meudon Observatory is installed was built in 1706 by the great architect Jules-Hardouin Mansart in orders by King Louis XIV for his son the Grand Dauphin. This was the last important project realized by Mansart. The gardens and water fontaines were constructed under the plans by Le Nôtre. Important visitors stayed in the Château de Meudon in the XVIII century as the Zar of Russia Peter the Great and the King of Poland Stanislas Leszczyski. After the French Revolution, a workshop to construct military balloons was settled in the area. These balloons played an important rôle in the Fleurus battle against Austria in 1794. Napoleon restaured the Château de Meudon and the Empress Marie-Louise and their son (the King of Rome) lived in the Castle. The terrasse was used by the prussians to shell Paris during the siege of 1870. The Château de Meudon took fire at that time. 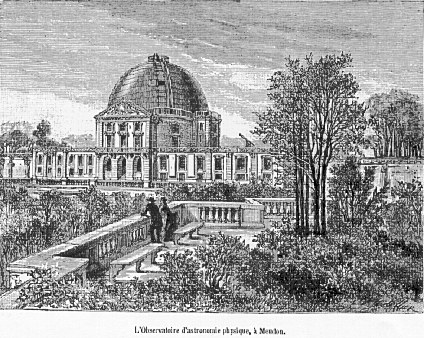 In 1876 the astronomer Jules Janssen created the Meudon Observatory and in 1893 a refraction telescope was installed over in the Castle. Musée - Atelier Rodin , Villa des Brillants Beaux-Arts. House-workshop and garden of the artist. Original casts of the work of the great sculptor. The Tomb of the sculptor with one his versions of the "The Thinker". Fondation Arp à Clamart 1.8 km (sud-est limit of the Meudon forest). House-workshop and garden of the artists Jean Arp and Sophie Taeuber who designed the house in 1960. Epured Cubism. Abstraction and Dadaisme. Kandinsky "Blaue Reiter"mouvement of 1912. Max Ernst, Tristan Tzara, Constructivist Théo Van Doesburg. Original and asttonishing constructions in the "Triangle des Châtaigniers" (Chestnuts Triangle) designed by Chemetov, Déroche and Lecaron architects.